“Great riad at the heard of Marrakech” We have stayed there for three nights and you feel like home. Abdul is an excellent host and always helpful. The place is really clean and the atmosphere is amazing and relaxing, about 4 minutes walking to the central square and many good options to eat around. Excellent Service. The staff is really friendly and helpful, wonderful place to relax just 4 minutes walking from the main square. Meget venlige, imødekommende og hjælpsomme værter. Da vi skulle forlade byen skulle vi nå et fly fra Marrakech lufthavn tidligt om morgenen, og skulle således afsted fra Riad'en før morgenmaden blev serveret. Det var dog intet problem, og det blev arrangeret lidt morgenmad specielt til os som nattevagten servede. Værelset var pænt og rent, og der var dejlig roligt på stedet. Vi anbefaler uden tvivl dette sted til alle der besøger Marrakech. “Amazing place! 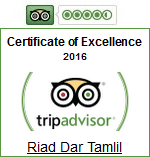 !” Riad Dar Tamlil is an amazing place to stay during exploring Marrakesh!! Beautiful, quiet, clean and in the best location, only 5 min walking to the main square! Many thanks to manager Abdul, who did everything he could for us to have a perfect vacation! Very polite, professional and informative about everything! Definitely recommended!! Nice people, convenient, comfortable It is quite simply incredibly good. Une petite perle, c' est bien l' expression! Ce riad niché a quelques rues de la place Jemaa el-fna (et donc très pratique) est un havre de paix. Les chambres sont ravissantes, élégamment décorées, le déjeuner est pantagruélique et la terrasse sur le toit permet de se reposer au calme, loin de l' agitation de la ville. De plus, le personnel est adorable et toujours a l' écoute ! Charm n Calm Lovely staff ..great service. Location great and convenient to all. Roof deck wonderful and the mint tea served there is a special treat. We had an excellent stay here! Just like everywhere we stayed in Morocco, very clean! The hosts were very informative and accommodating. We will stay here again in a heartbeat! Juste bien!! Agréable séjour dans ce Riad à la propreteé irréprochable..mais avons surtout apprécié le personnel !!! Abdou est très à l' écoute, très professionnel et incroyablement disponible, Hannan très discrète et sérieuse! Qq manques, remarques pertinentes exprimées aux propriétaires très réceptifs !